Just as a chemist must have intimate knowledge of the Periodic Table, a Monster Legends player needs to understand the game's elements and the strengths and weaknesses of each. At its core, everything in the game revolves around these elements ranging from what type of habitat you need to build for a particular monster to what type of temple they require to advance past level 10. Our Monster Legends breeding guide is categorized by element, from Fire through Metal, and provides several key details about each. You can also learn much more about the elements within the game itself as you progress through the beginner levels and follow the predefined goals, matching single-element and hybrid monsters with their appropriate building types, etc. Mastering the elements is also key when squaring off in battle. Team building is one of the most important proficiencies that you'll need to refine, as a well-structured group can often determine whether or not you leave the battlefield triumphant. Monster Legends provides a somewhat unique feature not available in most fights, both real and virtual, where you have the ability to add or remove team members from the scrum based on who your opponent is. Making these changes on-the-fly lets you carefully strategize before committing to a battle, ensuring that the monsters you send into the fray give you the best chance against a particular set of foes. Choosing which monsters to use at a given time should be based on their offensive and defensive strengths or weaknesses against certain elements, as well as the special skills and resistances that each possesses. Each one of your monsters has a specific set of skills in their arsenal, which can be viewed on their profile page along with pertinent details about each including their effects in battle. While understanding a monster's basic skill set is important before picking a fight, it's their special skills that can win a battle when utilized correctly. Featured at the bottom of the profile screen, special skills are often the most powerful and many can attack multiple foes at the same time or in turn heal or protect several team members simultaneously. Mastering these elite skills and knowing when and where to deploy them is a key survival skill in Monster Legends, especially against upper-echelon enemies. From the moment you step into the world of Monster Legends it's clear that there are many interesting things that you can do right from your starter island. While it may be fun to freestyle right out of the gate, and you certainly can deviate off the path as you become more comfortable, structure is a good thing until you are established. When Pandalf first greets you and begins to walk you through specific tasks, listen to him! The furry little guy is a seasoned Monster Master and knows his stuff. Even after you've gotten the ball rolling and he takes a back seat, the Goals button is almost always in view and you should press it regularly. Following the tasks set out for you in the order presented will help you advance to higher levels and achieve a much more satisfying gaming experience. As far as warfare is concerned, it is also good to follow the Adventure Map as designed. Hopping from fight to fight in a progressive manner will help you gain invaluable experience while getting used to different types of foes and battle strategies. In this case, practice makes perfect, and you'll also rack up a ton of loot and XP (experience points) along the way. The only way to compile a diverse, strong bestiary is through the magic of breeding. Pairing two creatures together to produce a Rare, Epic or Legendary monster is a surefire method for owning some of the game's most prolific beasts. A lot of breeding in Monster Legends is somewhat of a crapshoot, and quite often the output is not what you were hoping for. You can't be afraid to experiment, however, and eggs can always be sold to the Shop if you aren't satisfied. Although the result of sending two monsters to the Breeding Mountain is anything but certain, there are guidelines that you should follow to give yourself a better chance at the desired hatchling. Our in-depth breeding guide contains everything needed to master the science of in-game mating. In the heat of battle, many Monster Legends players focus on offensive and defensive skills and tend to forget about the useful inventory they're carrying around. Whether obtained in victory or purchased from the Shop's massive selection, these items can give you a sometimes necessary edge over the competition. Before a fight, you should know the purpose and effect of each item that you have, and be ready to use it when necessary. No matter if it's a healing scroll or a stick of dynamite to toss across the battlefield, what you have in your inventory can be just as important as the skills your monsters are endowed with. There are many ways to obtain gold and gems in Monster Legends, such as receiving a bounty for winning a battle or earning loot from your monsters in their habitats. You can even purchase virtual money with actual cash if you wish. One of the simplest methods for gathering wealth is by linking to your Facebook account and sharing updates and other statuses whenever the game prompts you to do so. In most of these instances, you'll receive gold or gems as compensation. 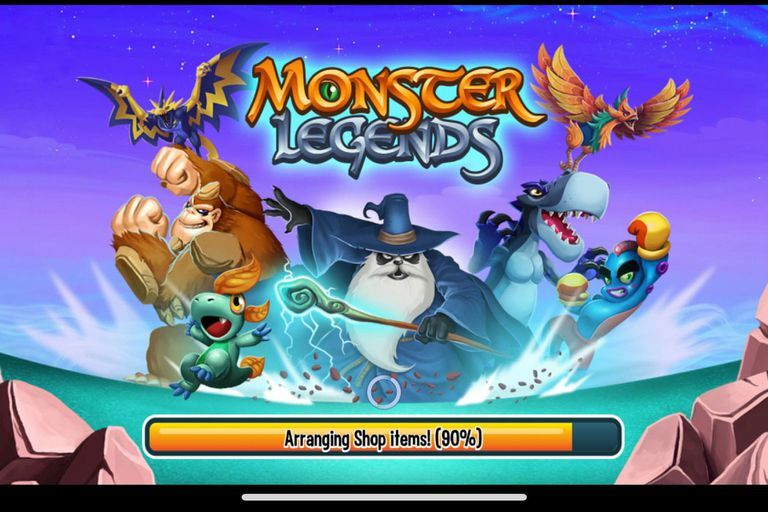 Another way to stuff your coffers is by inviting friends and family members to play Monster Legends. To get started you'll need to build a Recruitment Tavern on your island, which can be purchased in the Buildings section of the Shop for the low price of 500 gold. Your game account will need to be linked to Facebook in order to send invites from within the tavern. In addition to gold and gems, successfully recruiting new players can also earn you free food and monsters. As in the real world, food is a necessity when it comes to both survival and success in Monster Legends. Without proper sustenance, your monsters will not level up as needed and you'll languish in the newbie areas. Food is also needed to upgrade habitats and other building types at certain levels. You can earn food through daily bonuses, defeating computer-controlled monsters or by stealing it from others during PvP battles. It can also be purchased in the Shop with gems. Your monsters require a lot of food, however, and these methods simply do not produce enough to keep up. This is why you need to build and maintain farms on your island, allowing you to grow your own crops. Farms are purchased in the buildings section of the in-game Shop, with the size and output dependent on your level. You can only build one small farm when starting out, but that number continues to grow along with you, maxing out at 14 total farms for those players level 55 and above. Outside of combat, a lot of actions in Monster Legends involve waiting around. Whether you're constructing a new building, breeding two of your beasts or waiting for an egg to hatch, there seems to be a countdown timer on just about everything. The stronger the monster or the more complex the architecture, the longer the wait. In today's world where instant gratification has become the norm, this concept might seem ludicrous even though many of these items are worth waiting for. Even so, the game does offer a way to speed things up if you're willing to fork over some virtual dough. While it's certainly tempting to spend gold and gems rather than dealing with downtime, especially early in the game, you'll need that loot later on as demand increases and everything becomes much more expensive. Save your money and that restraint will pay off tenfold as you advance. That is, of course, unless you're a player who doesn't mind spending real-life money to purchase gem packs from the in-game Shop. In that case, patience may not always be a virtue. Let's face it. Cleaning is boring! Whether it's your room, laundry or anything else, this grueling task is nothing more than a necessary chore. The last thing you want to do when playing a video game is to clean. In Monster Legends, however, you can and should feel different about straightening up around the house -- err, island. Using your workers to clear bushes, rocks and trees will provide more space to erect habitats, farms, temples and other important buildings. That's not the only benefit of cleaning your island, either, as you'll earn XP for each natural impediment removed.